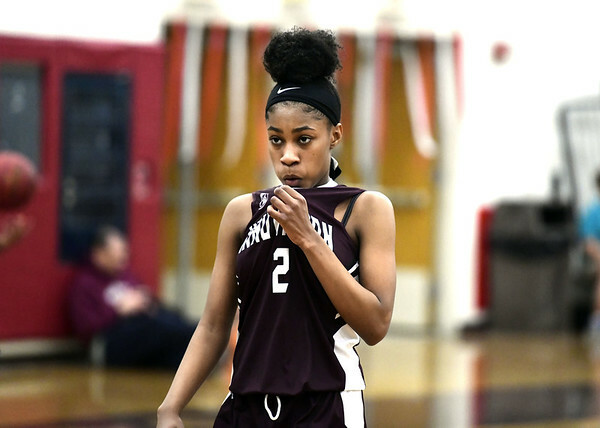 BRISTOL - Two minutes before the final buzzer sounded at Bristol Central High School, Rams senior Allison Jessie jogged over to the opposing team’s sideline when Central head coach Steve Gaudet called for a substitution. Jessie’s father and Innovation head coach Michael Jessie was waiting to give his daughter a hug before she stepped off her home floor for the last time. For Allison, the moment and the 51-14 win was a fitting end to her high school career. For Michael, it was a moment he wouldn’t forget, but it wasn’t an ending for him, at least not for this year. After his Ravens were shut out in the second half in the loss to the Rams, Jessie knew he had to get to work to save Innovation’s season. The Ravens, sitting at six wins with two games to go, need to win the final two in order to clinch a spot in the state tournament. The Ravens have dropped four of their last five after holding a four-game winning streak earlier in the season, and time is running out to salvage a spot in the tournament. There’s no room left for error, but Jessie isn’t losing hope. Like Friday night’s game, the Ravens went cold in the second half in their last meeting with HMTCA, finishing with just 17 points on the night. If the Ravens are to find themselves standing after these final two games, they will need some source of offense, which could be harder than ever to come by. Sophomore Ariana Rivas was coming off a record-setting performance on Wednesday night against Civic, where she finished with a school record 21 points in the 50-40 victory, but came up lame on Friday after getting fouled on a 3-point attempt. Rivers didn’t return to the game, and neither did the Ravens’ offense, which managed just five points the rest of the game. It remains to be seen if Rivas’ ankle will be ready for Monday’s match, but even if she can’t suit up, the Ravens feel they are greater than the sum of their parts, just as long as they’re able to play that way. Posted in New Britain Herald, Innovation on Sunday, 10 February 2019 21:49. Updated: Sunday, 10 February 2019 21:52.